It has been a busy week over at the West End Cottage with a lot of development taking place. This week's progress has softened the blow to a few setbacks from last week which are now thankfully sorted out. 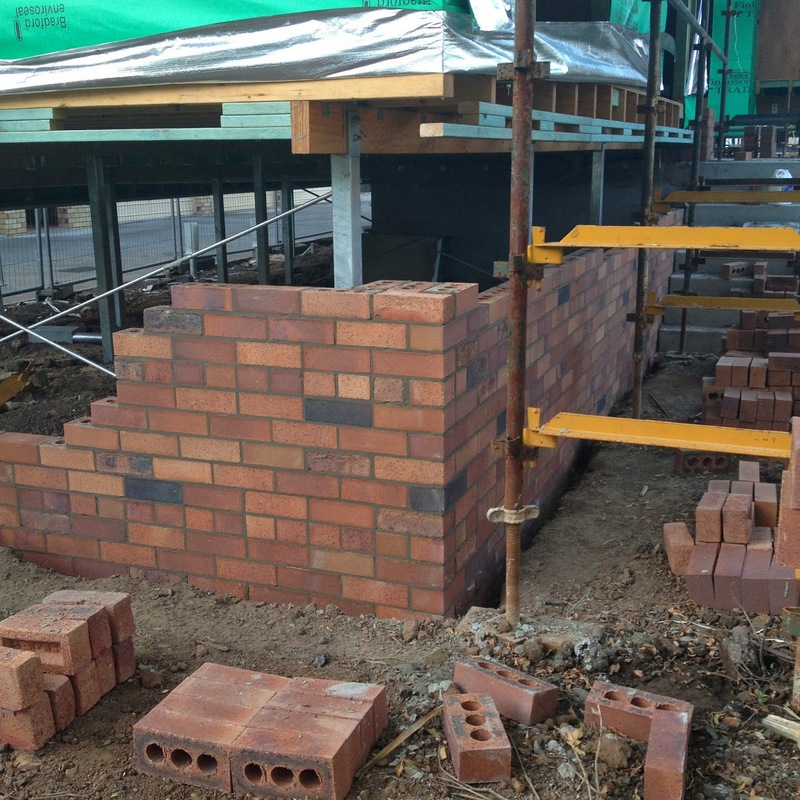 On Monday the bricklayers returned to make a start on the fireplace and surrounding walls. The bricks (which are actually a blend of five different PGH bricks) were individually selected by our architect and designed to create a gorgeous textural backdrop with the overall colours fitting in perfectly with both the old cottage and new contemporary addition. The fireplace and chimney will be built in stages as there are number of concrete elements in the design (ie lintels etc) which will require time to set. This part of the brickwork will take a bit of time to be fully completed but so far I've gotta say it looks absolutely amazing! The brickwork floors on the terrace and treads on the adjoining stairs will be done at a later date to ensure that they are not damaged during the remainder of construction. 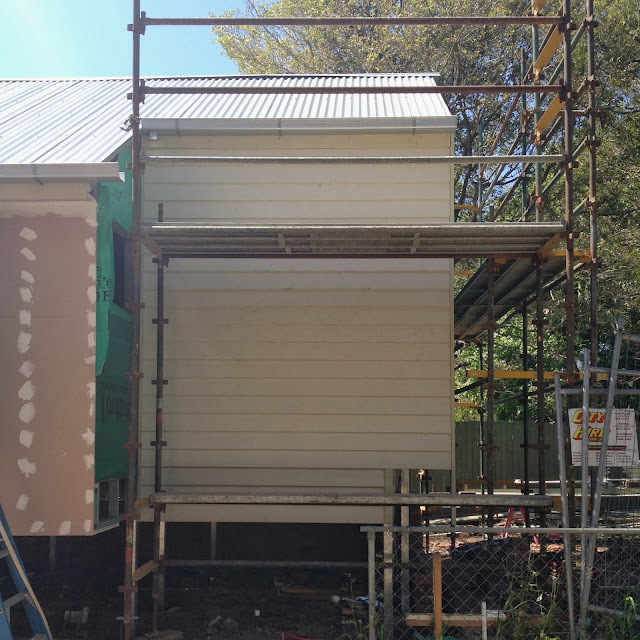 The new timber windows were delivered and installed which has enabled the builder to make a start on the cladding so our house is now starting to look like, well, a house. The windows designed for the kids' bedrooms are actually double full-height casement windows. What you see above are the window frames only which include a fixed balustrade to prevent falls. 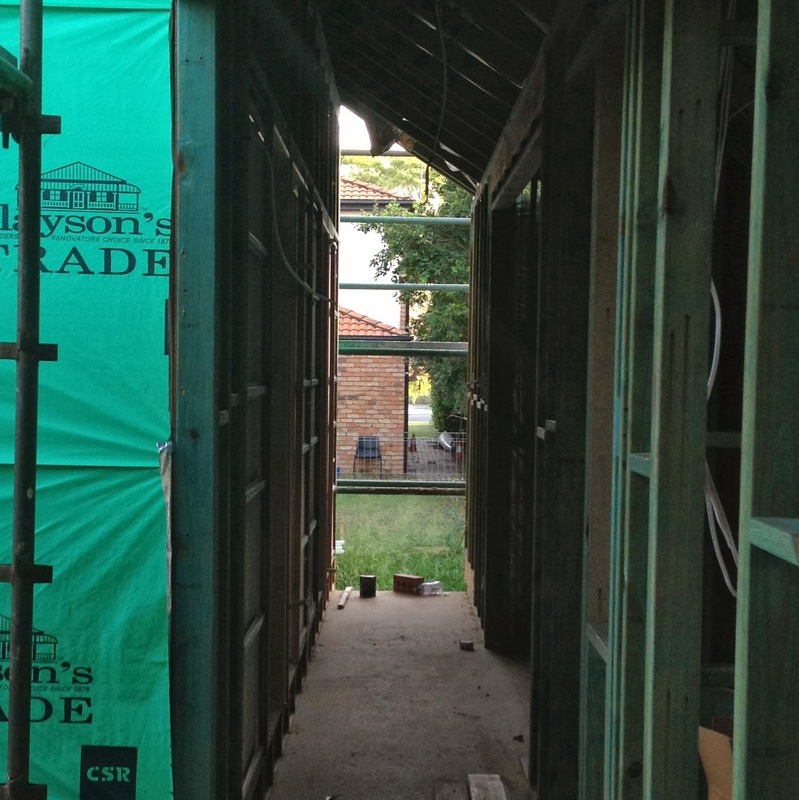 The actual casement windows (yet to be installed) are fitted with vertical timber blades that sit over the glazing. The blades provide screening from the sun but also force the views towards the vegetation down the side of the site. I was a little unsure about this window design at first but now they are in I really like them. I've got to give Allkind Joinery a plug for doing an absolutely wonderful job on the window and door joinery. Impeccable craftsmanship and service - well done. OK, so the view is nothing spectacular but it is a glimpse of water which is a little reminder of how close we live near the River and surrounding parkland. We are now only two weeks away before the plasterboard goes in at which point the cabinet maker will visit to complete a final check measure for the kitchen and bathroom cabinetry. All the fixtures and fittings have already been chosen, however I still need to select a marble slab for the kitchen and laundry benchtops which I plan to do after the school holidays. Wow! The cottage (I'm not sure we can still call it that!) really is something special! The design for the bedroom windows is great. What a bonus to catch a view of the river! This is getting so exciting! I may have to come for a drive over when we are home and bring a bottle of wine! To soothe our Renovation Souls? Your water views remind me of our city views...tip toes and a craned neck are necessary! It is all looking amazing...I love the brickwork and the huge windows. Thank you again for sharing the progress! It's going to look sensational when it is finished Caroline! I keep re-visiting this post to look at those bricks! Amazing! I love reading this journey. I particularly love that you are building a modest sized home, and you are happy for your boys to share bedrooms. We get so conditioned to big, more, now, don't we? I have spent the past few months paring back our possessions and genuinely feel like we could comfortably live in a smaller home. We have at least three areas that are barely used, other than walk-throughs. I'd much prefer clever, modest spaces. Week 17! It's looking so good. We've got a great view of a ugly block of flats! Can actually be quite entertaining though. Looks Amazing. Just discovered your amazing blog. I am also doing a project at Hawthorne and looks like we are living parallel project timeline lives... our cedar windows just got fitted as well. Love love love your design and concepts. Good luck.